On above map you can see points of arrival for ferries and buses from Dubrovnik, Split, Rijeka, Zagreb, Sarajevo, Mostar... All public transport arrival points are on max 5 minutes walk from the Apartments. 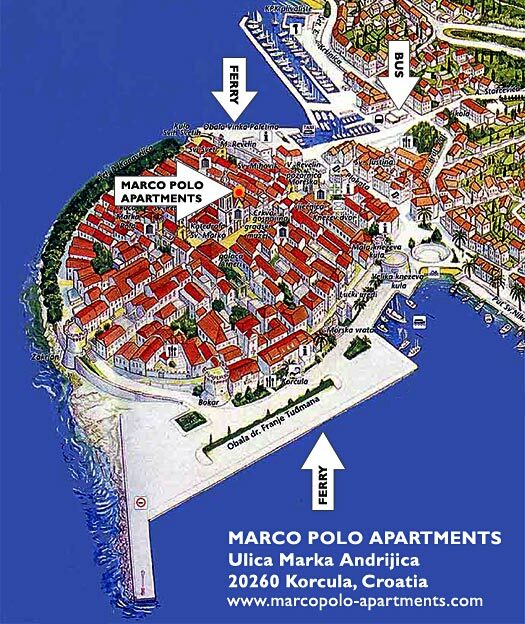 Korcula Travel Info: page with collection of info and links for various transport possibilities to and from Korcula. Korcula Flights - page with info about Korcula nearest airports as well as some flights info. Korcula Blog : Blog about travel to Korcula and surrounding area, check for latest updates and current issues.